Ghosts, goblins, boys and ghouls...join us for the annual Capitola Village Children's Halloween Parade! Line up begins at 1:30pm in the Beach & Village Parking Lot above Capitola City Hall. Parade begins promptly at 2pm. Parade will head down Capitola Avenue, wind through Capitola Village to the Esplanade ending at Esplanade Park, where trick-or-treat bags and refreshments will be waiting. 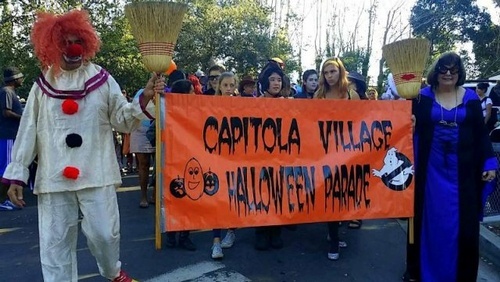 Children may trick-or-treat at Capitola Village shops following parade. Line up in the Beach & Village Parking Lot above Capitola City Hall at 1:30pm. Parade begins at 2pm. Parade will head down Capitola Avenue ending at Esplanade Park. Trick or Treat bags and refreshments at Esplanade Park. Line up at 1:30pm in Beach & Village Parking Lot above Capitola City Hall. Parade begins at 2pm.